Little Amadeus by Wunderkind is an animated series that entertains, educates, inspires children, and encourages them to make their own music. The series is geared toward children ages 4 to 8. Just looking at the Little Amadeus website was a wow moment for me. It's proof that there really are some great resources on the internet. The creators of Little Amadeus have obviously done their research and come up with ideas to teach classical music to children. Right now, my kids are watching the episode, "Solo for Amadeus". If I click on the parent and teacher section of the Little Amadeus website, I'll find lesson plans for the episode. This lesson plan includes objectives, information on the episode, a list of needed materials, background activities, various activities to try, extension activities, and more! If you're musically inclined, you can download the sheet music of your favorite compositions. My children really enjoy playing games on the computer. 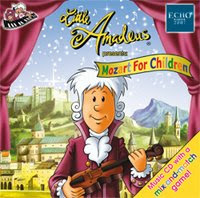 The Little Amadeus website has a large selection of games and activites to play based upon the tv series. And just when I thought I was done . . . I just found another great section. If you'll look at their resources, it teaches about different musical instruments, how to compose music, and also has printable coloring pages. Little Amadeus products can be found at Target stores and online. Check the Little Amadeus website for tv times in your area. I get a "no host found" error when I try to visit this site. Any idea what's up? Has the site moved?